Adriano Goldschmied AG The Nikki Jeans. 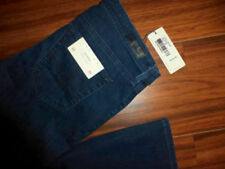 Size 28 R, Dark wash. Condition is Pre-owned, but very good condition. The inseam length is 30”. 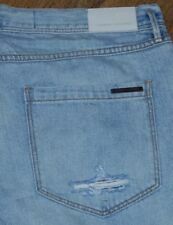 Adriano Goldschmied AG 27 Jeans Prima Cigarette Mid Rise Size 27R Blue Dark Wash. Condition is Pre-owned. Shipped with USPS Priority Mail. Adriano Goldschmied, AG Nikki Jeans. Size 28 Regular. Dark Wash. Condition is Pre-owned. Excellent condition. Nice and soft. 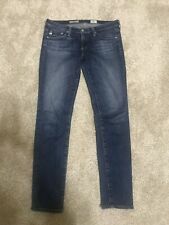 AG Adriano Goldschmied The Prima Mid Rise Cigarette Skinny Jeans Size 29R. Excellent pre-owned Condition, Like New Worn Once. Shipped with USPS Priority Mail. Features: 5 pocket cropped jeans with the option to roll up the hems in a darker wash and embroidered detail on the back pockets. AG 'THE PRIMA' BLACK MID-RISE CIGARETTE LEG JEANS. AG Adriano Goldschmied 'The Prima' super black cigarette leg jeans. Classic five pocket style with zip fly and button closure. 55% COTTON, 44% TENCEL, 2% PU. “We love the Stevie for its versatility and its exclusivity: this fab fit is available only here. —ANTHROPOLOGIE. “The Stevie Ankle” Jeans by AG ADRIANO GOLDSCHMIED. Skinny Leg, Ankle Cut. (Wash Faded at Knees). Grey wash jeans from AG Adriano Goldschmied! Stevie Slim Straight Leg Ankle Jeans. In excellent preowned condition. No stains, holes. Very minor wear on the inner upper thigh. 8.5” rise. 28” inseam. AG Adriano Goldschmied Jeans. Super cool splatter detail at the bottom hem. Boyfriend fit. Jeans are in good preowned condition. Adriano Goldschmied. Mid-Rise Cigarette. As well as possibly a household with animals. It is your discretion on if the item is worth the risk. As well as a few very tiny. Jeans have a slight "dirty wash" to the lighter areas. NWT Adriano Goldschmied AG White The Prima Mid Rise Cigarette Pants Women's 31 . Condition is New with tags. Retail price is $168. Pants have a soft feel to them. All of my items come from a clean smoke-free pet-free home. Item is sold as-is condition as pictured if you have any questions please ask before you bed thank you. Shipped with USPS Priority Mail. AG Adriano Goldschmied The Stevie Slim Straight Ankle Women's Size 29 Regular. Condition is Pre-owned. Shipped with USPS Priority Mail. I didn't try to get the red dot off the label. The inseam is 34". New with tags, purchased from the Ag Jeans website, Adriano Goldschmeid The Harper Essential Straight women’s jeans in the color 10 Years Cambria. I would describe the wash as medium blue denim with minor whiskering details. Size 30. Inseam 32”, waist 32”, rise 9.5”. All items come from a smoke free home. Free shipping within the United States. 15" across waist (aligned). 30" inseam. Excellent condition, only worn once and washed. AG Adriano Goldschmied Stilt Jeans - Cigarette Leg Denim. Skinny leg fit. Signature AG logo stitching on the rear pockets. Mid rise with a zip fly. We will do whatever we can to make things right if given the chance. You never know what you're going to find. These are in great used condition. Adriano Goldschmied The Stilt Cigerette skinny jeans. AG Adriano Goldschmied the lana wide leg trouser jeans in white. 98 cotton 2 polyurethane. AG ADRIANO GOLDSCHMIED THE LEGGING ANKLE SIZE 25 Fray Distressed Euc! Raw Hem!! Rare and gorgeous ag ADRIANO GOLDSCHMIED The legging ankle frayed jeans in 10 year Heirloom wash! 29 inch inseam, 8 inch rise, very comfortable and chic super skinny jeans! Any questions please feel free to ask and check out other items for sale!!! HAPPY SHOPPING!! 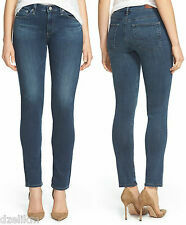 AG Adriano Goldschmied Mid-Rise Cigarette Crop Denim Stretch Jeans. Rise - 8 in. Waist - 13 (26) in. Inseam - 25 in. We love the Stevie for its versatility and its exclusivity: this fab fit is available only here. Wear this colorful pair with non-neutral neutrals like navy or stripes for a crisp, fuss-free look that goes anywhere. SML024681012142223 in.24 in.25 in.26 in.27 in.28 in.29 in.30 in.31 in.32 in.33 in. 2P26P25 in.26 in.28 in.29 in.30 in.31 in.32 in. 1126 in.27 in.28 in.29 in.